Going live with Virtual Administrator’s IT Essentials is easy, just follow the steps below. 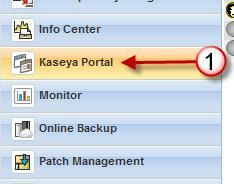 Step 2: From the Kaseya Portal menu, click on “BUY NOW” button under the “My Account” section. Step 3 – In the center of the screen you will see two options… “Monthly” (#3) or ” Yearly” (#4). At this point you will need to decide if you want to pay month-to-month, or annually for your Kaseya services. If you commit to Annually, you will not be able to change back until you get close to the end of your contract. Annual billing can save you up to 25% over month-to-month, so there is some incentive! Most of our partners choose Monthly so they can match expenses to income easily. Step 4 – After clicking one of the above, you will be presented with a table in which you can select the number of licenses for each service you wish to purchase. Remember you only need to purchase what you use, you can repeat this process in the future to add licenses at any time. There are a few areas that you need to select. Monthly Kaseya Machine License – Enter the number of agents that you wish to purchase (#5). You MUST purchase AT LEAST as many as are deployed, so if you have deployed more then you are ready to purchase, exit out and go back and delete the old agents. Also, be aware of any price breaks… Be sure to check my blog article on “How to Save money and even get some Free agents…” to make sure you get the best value. To finish up, accept the Terms and Conditions, and press “Continue“, and then enter your credit card information. Kaseya will keep this info on file and will automatically bill you every month.